ISTANBUL, TURKEY - Turkish President Recep Tayyip Erdogan is warning of military action against a key U.S. ally in the disputed Syrian city of Manbij, as bilateral tensions threaten to resurface between the NATO partners. "We will do what is necessary," was Erdogan's message to U.S. Secretary of State Mike Pompeo when they met Wednesday in Ankara, according to Turkish Foreign Minister Mevlut Cavusoglu who also attended the meeting. Ankara is demanding the removal of all members of the Syrian Kurdish militia YPG from Manbij. The YPG, supported by U.S. forces, helped to oust the Islamic State from the strategically important city in 2016. But Ankara designates the militia as terrorists linked to the PKK, which is waging a decades-long Kurdish insurgency inside Turkey. Washington's backing of the YPG in its war against the Islamic State remains a point of tension with Ankara. Under a road map agreed earlier this year to defuse bilateral differences, the militia would withdraw from Manbij, and joint U.S.-Turkish patrols of the city would be started. However, Ankara is voicing growing frustration over what it sees as Washington backsliding. "Turkey is ready to eliminate terrorists in Syria's Manbij if the U.S. is facing difficulties," Cavusoglu said Wednesday after meeting with Pompeo. Cavusoglu said it has been more than five months since the deal over Manbij had been agreed. 'Some delays are normal during the groundwork, but there should not be a resistance from the [US] army in the ground,' Cavusoglu said. Ankara has often criticized American forces in Syria of being too sympathetic to the Kurdish militia. FILE - A U.S. soldier sits atop an armored vehicle at a newly installed position, near the tense frontline between the U.S-backed Syrian Manbij Military Council and Turkey-backed fighters, in Manbij, northern Syria, April 4, 2018. The Manbij road map until now was seen by analysts as a success, "The working relationship is still in place in Syria. 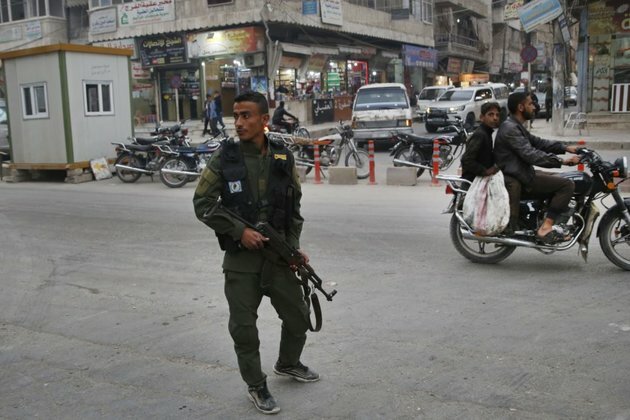 We are still waiting for the joint patrol operation to start in Manbij," said former senior Turkish diplomat Aydin Selcen, who served widely in the region, "The [anti-US] rhetoric, we can say, by President Erdogan until now was dialed back a bit." Analysts suggest Cavusoglu's latest comment are likely in response to the lack of urgency expressed by the U.S. Chairman of the Joint Chiefs of Staff Gen. Joseph Dunford. 'As for joint patrols - first, how to perform patrols, how to command and control. We need to develop a staffing plan, including what will be the rules of engagement. Then we have to train the people we have chosen to perform these joint patrols," Dunford said Tuesday. "Obviously, we are moving forward with rational steps," Dunford added. "This is not an urgent issue. The urgent security issues were addressed immediately,' he added. Ankara's suspicions of Washington are heightened by its new stated goal of curtailing Iran's influence in Syria. "Syria needs to get rid of the image of a country that exports terrorism to its neighbors. Also, militia groups fighting on behalf of Iran should be removed from the ground,' said U.S. envoy for Syria, Ambassador James Jeffrey. FILE - Fighters from the U.S-backed Syrian Manbij Military Council stand behind a sand barrier as they look toward a Turkey-backed fighters' position at the frontline of Halawanji village, north of Manbij, Syria, March 29, 2018. With the YPG controlling a large swath of northern Syria, including much of the Syrian-Iraqi frontier, observers say Washington sees it as key to containing Iranian influence. Manbij, on a main highway between Iraq and Syria is widely regarded as having particular strategic importance. Ankara and Washington recently took a significant step to improve ties. Earlier this month American pastor Andrew Brunson was allowed to return to the United States after more than two years in detention on terrorism charges. Washington called the charges baseless and politically motivated. But international relations expert Soli Ozel of Istanbul's Kadir Has University says Manbij symbolizes the deepening mistrust between Turkey and the United States. "My sense the most fundamental problem is that Turkish interests in the Middle East and American interests in the Middle East are not the same. Are they totally incompatible I am not sure," said Ozel. While Washington sees Tehran as the region's main threat, Ankara has been deepening its cooperation with Iran over Syria. Ankara, Tehran, and Moscow have been coordinating efforts to end the civil war, even though they back rivals sides. Observers suggest Iran will likely seek to exploit growing U.S.-Turkish tensions over Manbij. Turkey's pro-government Sabah newspaper reported Wednesday the Free Syrian Army is seeking a green light from Turkey to move against the YPG in Manbij 'in 20 days if Ankara instructs us," said Adnan Abu Faisal, the FSA military assembly leader. 'The FSA has sworn to bury the PKK in their own pits and return the area to real owners," he added.